Just over 1 mile from the centre of Betws-y-Coed, The Park Hill offers high-quality rooms, full cooked breakfast and an indoor pool and sauna. Around 25 minutes’ drive from Mount Snowdon, this Conwy guest house also provides free Wi-Fi. Each room has a flat-screen TV, hairdryer and tea and coffee facilities. All have an en suite shower or bath. Cooked breakfast is served each morning, along with a buffet selection including cereals, fresh fruit and yoghurt. Packed lunches can also be supplied on request. The Park Hill has an indoor swimming pool, steam room and sauna, housed in a pine cabin. Storage facilities for bikes and luggage are also supplied. Betws-y-Coed is home to attractions including the Alison Bradley Gallery, Conwy Valley Railway Museum and the Snowdonia Visitor Centre. 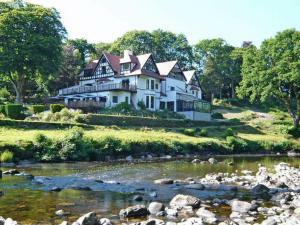 Gwydyr Forest Park is also around 5 minutes’ drive from this guest house. When would you like to stay at The Park Hill ? This en suite room has a flat-screen TV, hairdryer and tea and coffee facilities. This en suite twin room has a flat-screen TV, hairdryer and tea/coffee making facilities. Please inform The Park Hill in advance of your expected arrival time. You can use the Special Requests box when booking, or contact the property directly with the contact details provided in your confirmation. Each day we'll check prices and send you an email for your selected dates at The Park Hill. If you don't have specific dates but would like to check prices for say next weekend or say next month we can check the price too. Click to write a review and share your experience of The Park Hill with other travellers.